It’s a universal truth: nobody likes pain. Yet how we each deal with pain varies greatly. For years, the methodology didn’t vary that much – the accepted prescribing practice was painkillers in the form of opioids, especially after surgery. We now know that these prescribing practices led to a significant number of people becoming addicted and to the diversion and misuse of the drugs because of an overwhelming supply of unused medication in people’s homes. While heroin and fentanyl overdoses receive the most media attention, the growth in opioid prescriptions is certainly alarming. Doctors wrote 72 opioid prescriptions per 100 persons in 2006, according to the Centers for Disease Control (CDC). Just six years later, that number ballooned to 259 opioid prescriptions! From 1999 to 2016, more than 200,000 people died in the United States from overdoses related to prescription opioids. Another disturbing fact is that, according to the CDC study, most heroin users have a history of addiction to prescription opioids first. Doctors and hospitals are taking notice and states and hospitals are working together to adopt guidelines to arrest this shocking trend. 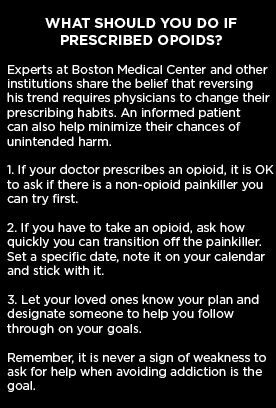 In Massachusetts for example, Governor Charlie Baker signed into law limits on opioid prescribing which will reduce the availability of the medication, promote alternative pain-management therapies and hopefully limit the number of overdose deaths. Prescribers must now check the Prescription Monitoring Program (PMP) every time a Schedule II and III narcotic is prescribed. 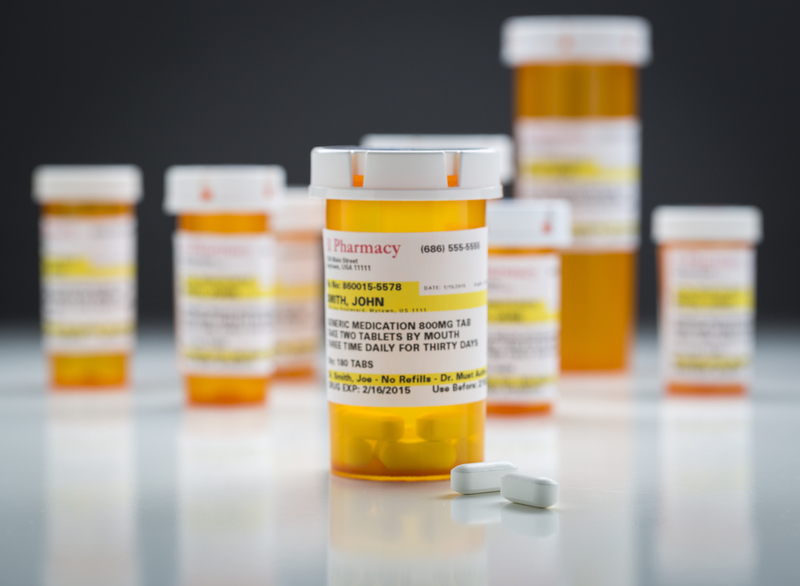 New patients may only receive a 7-day prescription and patients may also request a partially-filled opioid prescription. New stewardship and education programs will also be created. 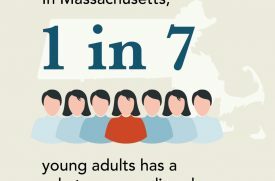 Clearly the Massachusetts government is taking the opioid epidemic very seriously. From 1999 to 2016, more than 200,000 people died in the United States from overdoses related to prescription opioids. In New Hampshire, Dartmouth-Hitchcock Medical Center recently instituted new restrictions on opioid prescriptions. The journal Annals of Surgery just published results that found a 53% reduction in the number of pain pills prescribed for five common outpatient procedures. One basic change, according to a recent New Hampshire Public Radio article, was simply to reduce the number of pills being prescribed. Dr. Richard Barth, a surgical oncologist at Dartmouth-Hitchcock, told NHPR the changes were made after surveying former patients about their pill intake, a study that revealed these patients took just 28% of the prescribed pills. Perhaps not surprisingly, the remaining pills often end up in a non-patient’s hands. The medical staff also recommended the use of over-the-counter painkillers such as ibuprofen and acetaminophen. “If we cut down the number of opioids that are prescribed, we’ll have a big impact on the number of deaths down the road,” Dr. Barth told NHPR. 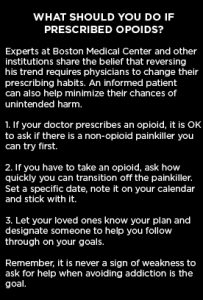 Boston Medical Center and Boston University School of Medicine also created a national model called “Safe and Competent Opioid Prescribing Education” (SCOPE of Pain). SCOPE of Pain offers a core curriculum, an online training program supplemented with in-person events, and supplemental training, and extended training modules. This comprehensive approach addresses all elements of prescription education with the belief that with knowledge comes the power to manage pain therapies and stop the opioid addiction epidemic. Further, in October 2017, BMC set a goal to reduce opioid prescribing to surgical patients. In just one year there has been a 27% reduction in opioid prescriptions for surgical patients and no increase in requests for refills. 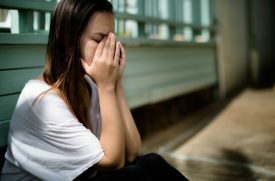 This proves that patients’ pain can be successfully managed with little to no opioid medication. A team of researchers at the University of Michigan has drawn similar conclusions. 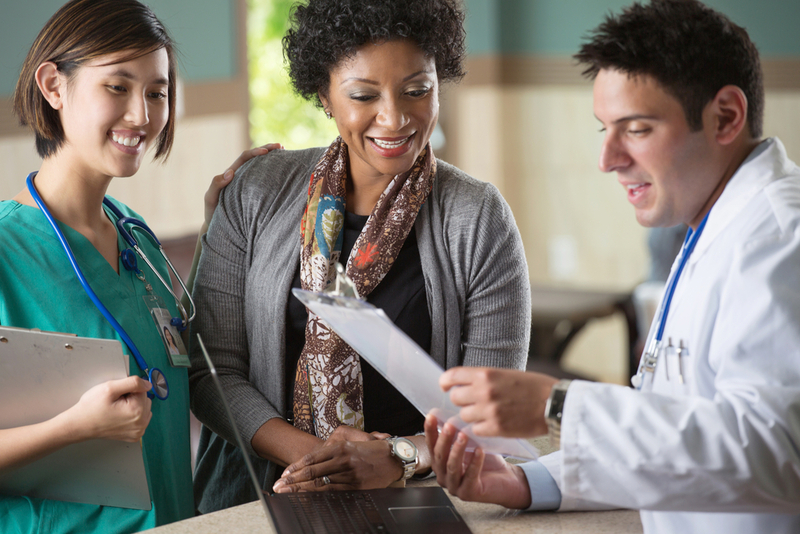 Their study, published in JAMA Surgery, indicates the benefits from a better understanding of pain prescription use and pain control education for patients and surgical teams. Using gallbladder removal, a common operation, the scientists discovered patients used only 6 of the 50 pills they were given post-surgery! Most of the leftover pills remained in medicine cabinets. This alarming statistic led to approval of new lower prescription guidelines and patient education documents. As a result, the average prescriptions for new patients dropped 66% to just 15 pills, or 75 milligrams of opioids. Dr. Howard estimates the new guidelines for gallbladder surgery alone have removed 13,000 excess opioid pills from America’s medicine cabinets! Taken together, these institutions are setting the standards for opioid-based medical treatment for the benefit of the entire nation.